Nowadays smartwatches are becoming a trend among gadget lovers. More companies are manufacturing smartwatches (even the traditional watch companies like Fossil) due to its large market. 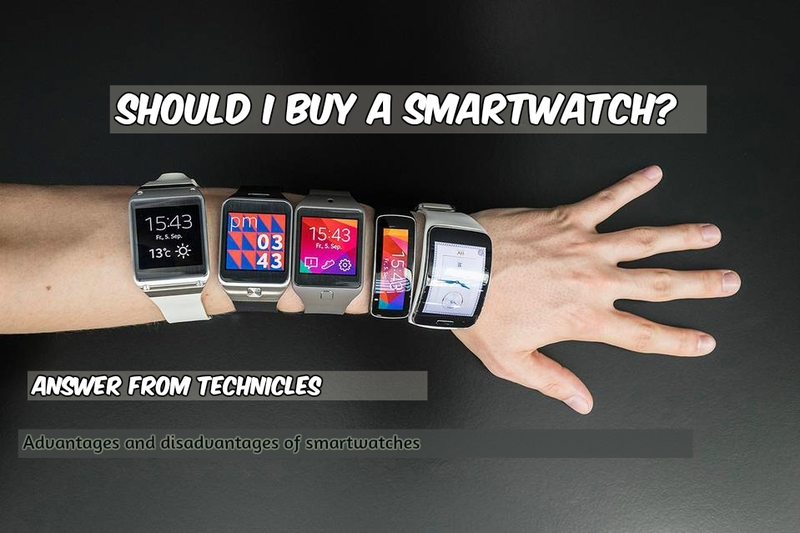 Its time to discuss about the pros and cons of smartwatches so you can decide you should buy one or not. Are smart watches worth its price?. If you talk about the primary function of a watch – it is definitely showing you the time. But In case of a smartwatch, the most important function is to show you the notifications and you will have a quick access to them. It allows you to read a message or checking out a Facebook notification without picking up your mobile phone. If you are in busy street, especially riding a motor bike, it is very normal to miss a call because the ring sound and the vibration was not enough for you to know in the rush. Smartwatches gives a vibration when someone calls you or texts you. Another advantage is that you can decide easily whether to pick the call or leave, by just looking at the watch. Smartwatches lets you count the steps, so you can exercise every day to meet your goals. It analyses your sleep data – shows you how much you slept every day. This can really help you to make necessary adjustments to your sleep timings for a better sleep. Some smartwatches allows you to make calls even though the volume is quite low. You can send text messages as well as read them. If you are not bothered about the screen size, your smartwatch can become your new movie theater. A full length movie can be watched in a smartwatch without any problem. Smartwatch allows you to connect earphones so that you can listen to music as well. If you use a normal watch, it normal to get bored seeing the dial every day. A smartwatch can change the dial / watch face every day. This makes it more stylish. If you are a person who travels a lot, especially in a two wheeler where smartphone mounts are not reliable, a smartwatch can be beneficial for you. It shows you the map and GPS enabled smartwatch allows you to travel with convenience. This is a number one con for a smartwatch. Smartwatches typically can be used 1-2 days after a full charge and some watches not even last for a day. Watches are something you wear everyday and if you forget to charge it by end of the day, you will end up having a dead watch next day morning. This also prevents you to do sleep tracking as the battery is low and you have to charge it before using it. Even though smartwatches are able to provide you tonnes of data regarding your exercise and fitness, many smartwatch tests shows that the data is not 100% accurate and not even 80% sometimes. The steps calculator and heart rate sensors are not known for accuracy in a smartwatch. Hopefully the brands are working on imporving the sensor feedback and analyzing the data. As we get a lot of notifications everyday, we might feel that everything is cluttered in a small space of a smartwatch display. But as it a watch and to be wear, we cant do much about it. But watching movies and navigation may become an extra effort for your eyes and better don’t use these features if you have eye problems. Even if smartwatches are making your life easy, you can definitely live without it. It is not a must have accessory. It is not something which you have to go back and get if you forgot to take it. Also smartwatches works in sync with smartphones and it can never replace a mobile phone. We already know about smartphones. How long will you use a smartphone?. Not more that two years I guess. But most of you would not like to spend a large money in smartwatches. These gadgets runs on android and and similar OS which are upgraded frequently. So if you buy a smartwatch now, probably it would be outdated from an year from now or two. A decent smartwatch like Motorola 360 or Samsung gear will cost around 20k-30k (INR) which is a big deal considering the chances that you will buy a new one in the coming years and the value it offers for the money. Most of the smartwatches are water proof, but the bands /straps are likely to get damaged if you are constantly using it in water. This is not really a con but your main purpose is to track fitness, then it is a better option to buy a fitness band which is way cheaper than a smart watch. A fitness band like Mi Band 2, Lenovo fitness band will cover most of the fitness needs and are cheaper too. Another major advantage of using a band is its battery life. A band like Xiaomi Mi band 2 will last for 3 weeks to a month (based on usage) in comparison to 1 day for a smartwatch. PreviousiPhone 7 Plus Clone (Fake iPhone) Review – Worth Buying?